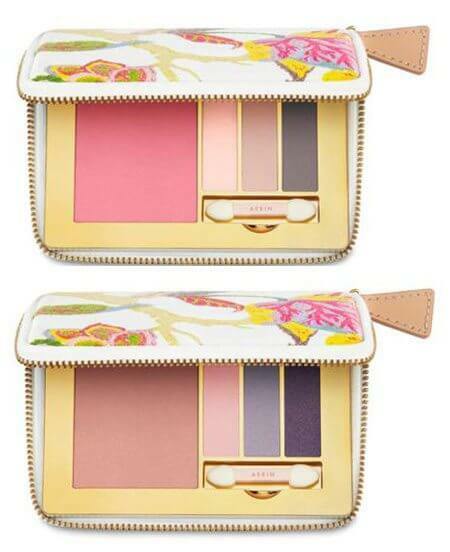 If you were blown away by the Aerin Lauder launch collection and Fall palettes, prepare to fall in love of the completely besotted kind with her Garden Colour Collection Spring 2013. Launching in the first week of February, this super-pretty range of makeup is not only gorgeous to look at but also very wearable – a rare combination. The British Beauty Blogger (one of my absolute favourite beauty blogs!) has dug out the first images of the launch and here they are! Aerin has always promised a well curated collection rather than one that has 80 mind boggling products, over half of which have no relevance to anybody. And in keeping with that aesthetic, the Garden Colour Collection (swatches coming soon) starts off with two Style Palettes, which come as zip-able compacts that are chic enough to be carried as mini-clutches for the evening. Then there are two Multi Color Compacts for Lips & Cheeks, which are really versatile and come packaged in the hammered golden case that’s become the signature of Aerin’s makeup collections. The prettiest product of the collection, however, has to be the Floral Illuminating Powder. I am getting two of these – one to use, one to keep! There is also a selection of lipsticks and lip glosses, which run the gamut from soft neutrals to vivid pinks. I can’t wait for this one to hit the shelves. Can you? All images courtesy British Beauty Blogger. « Could soaps get any cuter?